Having a previous cesarean delivery significantly increased the risk of reoperation and complications among women undergoing a hysterectomy later in life, according to a study published by JAMA Surgery. 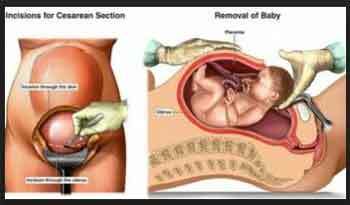 Cesarean delivery is the most common major surgery performed in the world, and the rate is rapidly increasing. The global average cesarean rate is estimated at 18.6 percent. The influence of cesarean deliveries on surgical complications later in life has been understudied. Sofie A.I. Lindquist, M.D., of Aalborg University, Aalborg, Denmark and colleagues conducted a study that used data from Danish nationwide registers on all women who gave birth for the first time between January 1993 and December 2012 and underwent a benign hysterectomy between January 1996 and December 2012. Of the 7,685 women who met inclusion criteria for the study, 69 percent had no previous cesarean delivery, 22 percent had one cesarean delivery, and 9.4 percent had two or more cesarean deliveries. In total, 388 women (5 percent) had a reoperation within 30 days after a hysterectomy. Compared with women having only vaginal deliveries, women with one cesarean delivery had a 31 percent increased risk of reoperation after a hysterectomy; women with two or more cesarean deliveries had a 35 percent increased risk of reoperation. Surgical complications were more frequent in women with previous cesarean deliveries. Women having two or more cesarean deliveries were more likely to receive a blood transfusion. The study notes some limitations, including the observational design, which does not allow for elimination of all potential confounding factors. “The results support policies and clinical efforts to prevent cesarean deliveries that are not medically indicated,” the authors write.